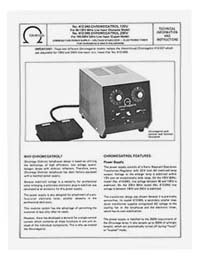 High quality copy of the Technical Information and Instructions sheet for the 412-040 and 412-045 Chromegatrol combination power supply - voltage stabilizer - electronic timer as used with Super Chromega D Dichroic and Super Chromega E Dichroic lamphouses. We also include a parts diagram and parts list. 8½" x 11" format. Folded. 4 pages plus parts diagrams and parts lists. For Chromegatrol #412-037 which is convertible from 120V 60Hz to 220V 50Hz operation see separate listing.